Drive to Siem Reap and check in at your hotel, your stylish three night Special Stay. Freechoice: Journey to the serene Kuang Si Waterfalls or discover different methods of weaving and dyeing textiles. Alternatively set off on a bike ride to discover why Luang Prabang has become a haven for artists. 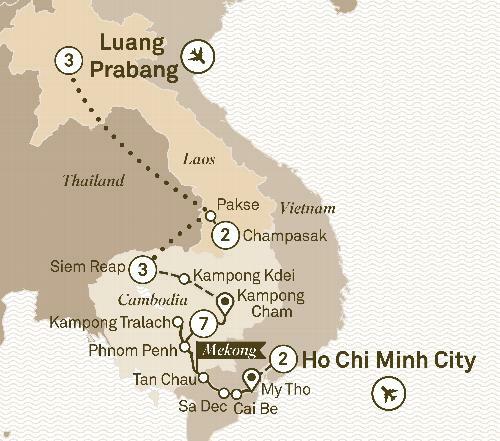 Cruise the Mekong on an 18 day journey from Ho Chi Minh City to Luang Prabang on board the lavish Scenic Spirit. Visit Phnom Penh, Siem Reap & Angkor Wat. The wonders of Indochina are just waiting for you to discover them during this joyful journey. For those who may have previously dipped their toes into South East Asia, this is a chance to delve just that little bit deeper into the intriguing Mekong River. Cruising the Mekong is notched up several levels thanks to our all-inclusive luxury. From the moment you embark to the second you disembark, you’ll want for nothing. Along the way you’ll uncover floating markets, seek out ancient artefacts and visit initiatives changing the lives of street kids forever. An awe-inspiring sunrise over Angkor Wat helps to farewell Cambodia before you say Sai-bai-Dee (hello), to the hidden gem that is Laos. Three nights spent in the spiritual capital of Luang Prabang offers a perfect way to round out your time in this sublime part of the world.